The feet are the foundation of the entire body. Like a foundation to a building if your feet are not level it can cause problems higher up in your body. So any fallen arch or misalignment in the feet can lead to pain (now or later) in the feet, knees, hips, back or neck and cause these joints to undergo degeneration. It is important that you have your feet and not just your spine assessed, adjusted and supported. Better Backs Chiropractic and Natural Products does this with Foot Levelers. What are Foot Levelers? Orthotics. 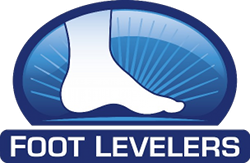 Foot levelers is a company that has been manufacturing custom made orthotics called Spinal Stabilisers for more than 55 years. 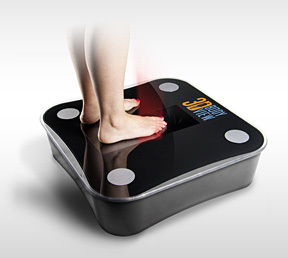 A special #D digital foot scanner is used to examine your feet. Each foot has three arches which can affect your posture, strength and joint wear. After your foot is scanned while you are standing, a color photo of your feet will show where the pressure travels through your feet. If there are areas of unusual pressure seen in your scans then Dr David Jones, Chiropractor will discuss and recommend exercises and or orthotics which will be custom made for your feet. These orthotics are particularly useful for those with recurrent feet, knee, hip and low back problems but can be used by athletes for injury prevention and performance enhancement. Orthotics can be made and worn for many types of foot wear not just runners. With ice skates, inline skates, football boots, high heels, snowboard boots, gumboots and work boots, thongs thats right we even have custom made orthotic thongs so there is never an excuse for being without the right type of support for your feet. 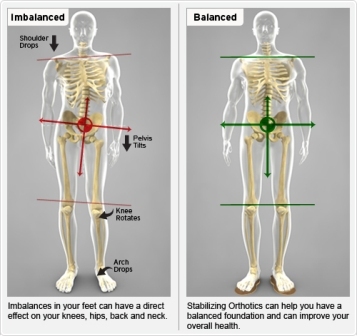 What is the advantage of Footlevelers Stabilisers over standard orthotics? Footlevelers are different to a standard orthotic. Footlevelers Stabilisers provide support to all three arches of the foot, many others only to the medial arch. The combination of flexible, yet supportive and durable materials ensures that the Footlevers orthotics will both guide the feet when walking and provide support for long periods when standing. A variety of styles are available for all activity levels. Full length and dress length Stabilizers fit a wide variety of shoe style. We even have orthotics for high heel shoes, thongs and sandals. The flexible spinal Stabilizers encourage optimal muscle and nerve function by guiding feet through a more normal pattern with each step taken. 100% money back guarantee once worn in for at least 45 days. FootLevers orthotics are custom made and fitted to your shoes. Dr David Jones, chiropractor has trained in Advanced Spinal Stabilisation and is certified for fitting the orthotics. These two mean that most private health insurers will give a benefit on Footlevers made orthotics but that depends on your individual health insurer and your level of cover.